Material Safety Data Sheets for Citifluor Antifadent/Photobleaching Solution products are available in PDF format (Adobe® Reader required). Click on the links below for each data sheet (max. 110Kb) – they open in a new window; just close to return to this page. Mountant Media Solution Safety Data sheets also available. 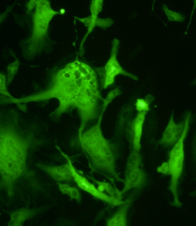 Fluorescence microscopy – cells expressing the Green Fluorescent Protein (GFP). As a post-doc in London, I was really impressed with Citifluor. Now I’m back in the US, starting my own lab and can’t find anything as good.